Cotton Mulch: Its that time of year, when the Cotton fields are picked, bailed and sent to the Gin. After all the seed and other debris is removed from the cotton modules, at the Gin, the trash is than used for mulch. By mid March, all well be gone as it takes only a few months for the mulch to completely decompose and provide fertilizer to our soil, and we're ready for spring! MULCH: The use of mulch is very beneficial through out the year, during the summer months it holds and retains moisture within the soil, reducing water loss due to extreme heat and drying hot winds. It prevents splash up, by keeping the soil from splashing on to the plants and thus prevents soil borne bacteria from getting on the plants and causing disease and other problems. During the winter it helps to moderate soil temperatures. 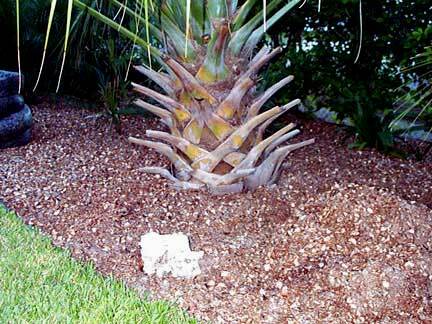 A 3 to 4 inch layer of mulch is highly recommended.